Are you a bride-to-be? Searching for your dream dress? Then this is the place to be. 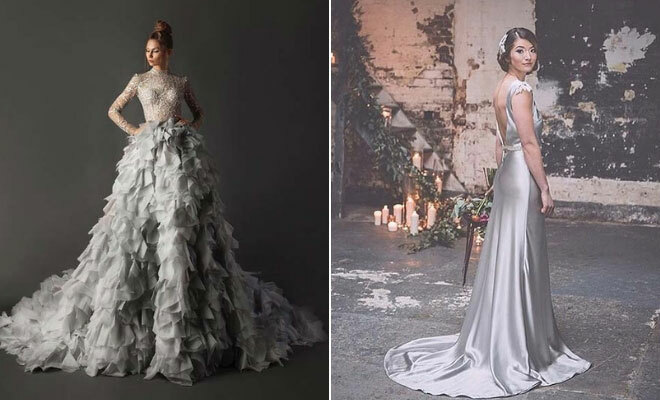 We have found 21 beautiful silver wedding dresses that you need to see! We know that silver may not be your first color choice as you may be thinking of the classics like white. 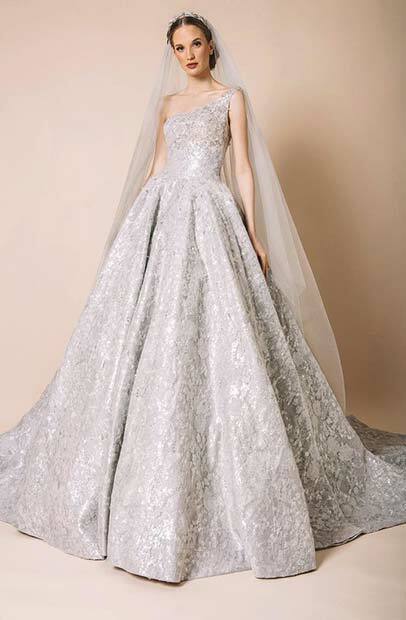 However, before you make your decision, you need to see these gorgeous silver gowns. Every one of these dresses are elegant and will suit everyone. 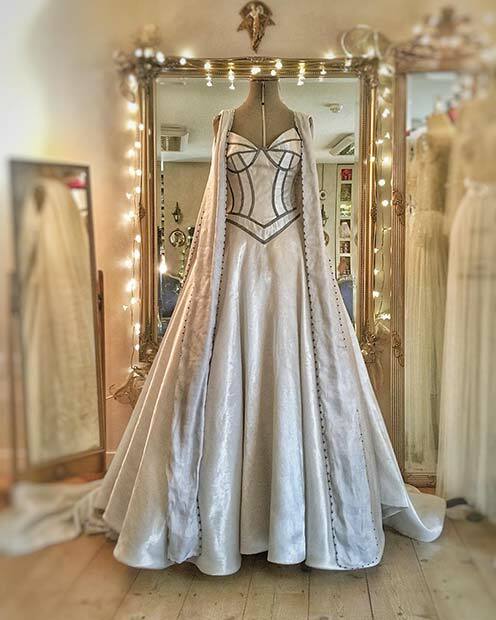 We have unique gowns, princess dresses, sleek and stylish pieces and more. Take a look, you will soon be walking down the aisle in a stunning silver wedding dress. We would like to begin by showing you this beautiful bridal gown. The dress has one strap giving it a stylish asymmetric look with a close fitting bodice. At the waist, the skirt flows out and creates a princess style dress. It is a stunning silvery color and it is perfect for the bride who wants a glam gown that looks straight from a fairy tale. If the white ballroom style gowns are not for you and you would like to try something a little different, then take a look at this next dress. This gown is sleek and simple in a stylish silver color. A dress like this is a great choice for the brides who want a gown that is easy to wear and that is stunning too. Your wedding is a special event in your life. So, it is important that your wedding dress is perfect for you. 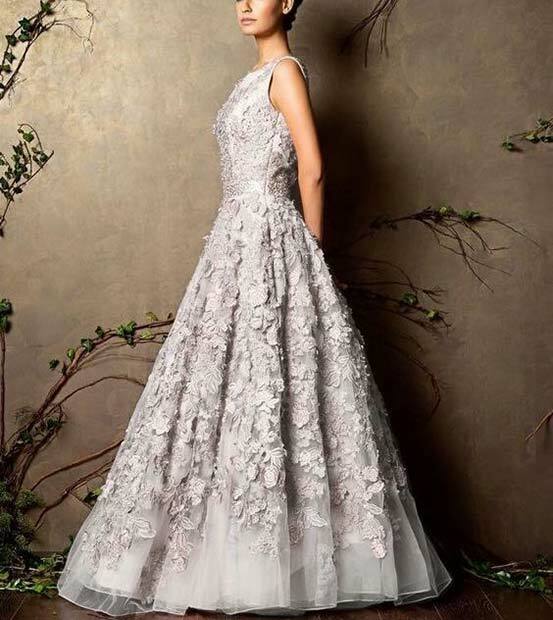 Whether that is a classic white gown or a unique and bespoke dress like this one. 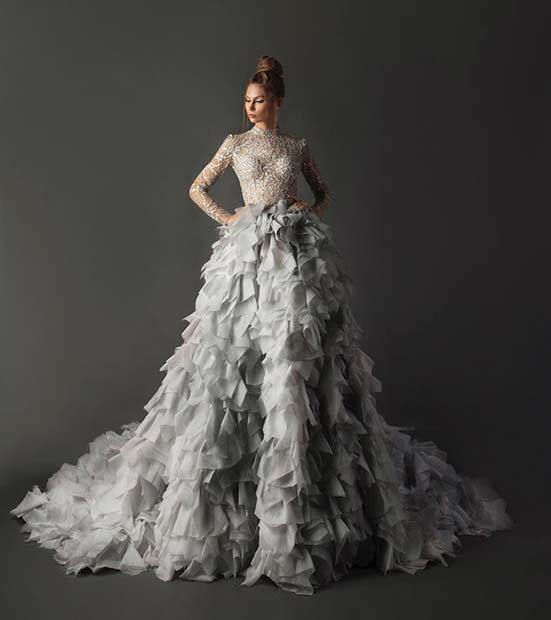 This silver wedding gown was inspired by warrior queens. It is a stunning dress and suits the wedding that took place in a Gothic castle perfectly. Make sure your dress is one to remember and pick one that shows off your individual style! Next, we have a gorgeous embellished dress to show you. The gown is a silver color with straps and a flowing skirt. All of the dress has been decorated with what appears to be a floral design. A gown like this will suit the brides that are looking for a stylish, elegant and pretty dress. You can get embellished dresses in all different shapes and styles. Looking for a glam gown? Then this is for you. The dress has a beautiful, flowing skirt with a close fitting bodice and stylish straps. 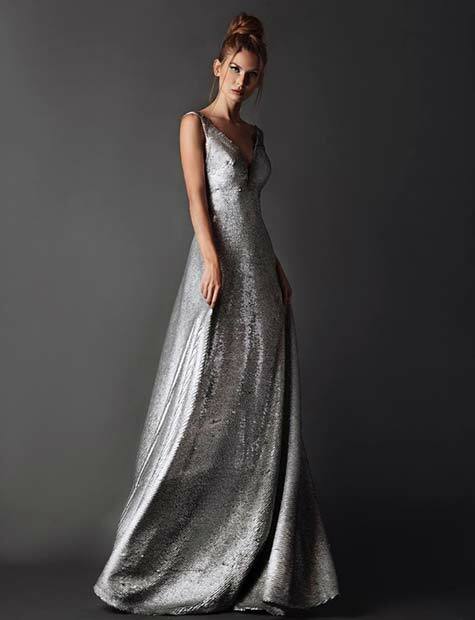 This is a stunning silver gown and it would be perfect for summer weddings. It is a dress that gives you the best of both – you get a princess style dress on the top half, and the skirt is sleek and easy to wear. Speaking of summer weddings, this next dress would be perfect for a summer bride! The dress has a plunging neckline and the whole gown is lightweight, flowing and loose. It has a gorgeous design and a dress like this would look fabulous on the beach or for a boho theme wedding. 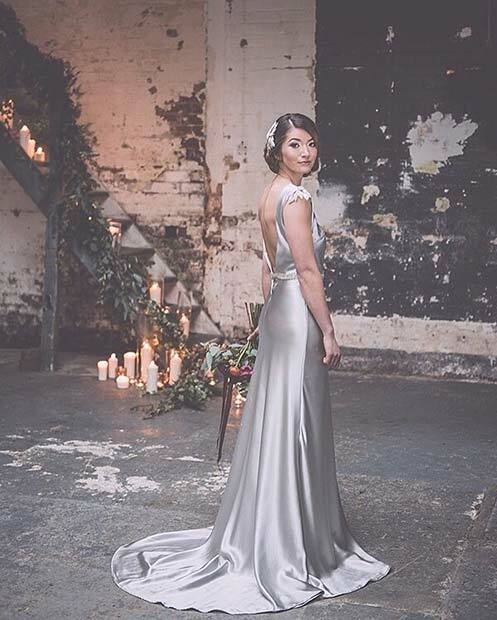 We love this silver wedding dress! Our next idea features a stunning silver dress. This gown is silky, sleek and backless. It has a 1920’s vibe so a dress like this would look fabulous at a wedding with a vintage theme. There are lots of gowns like this available, so you can find one that suits your personal style. Like to stand out from the crowd? Then this is the dress for you! The gown has a close fitting bodice with a high neck and sleeves. At the waist, the skirt gets bigger, changes material and makes a real statement. The skirt has multiple layers of fabric which creates a trendsetting gown. A dress like this is for the brides that want to wow! The next dress we have to share shows how elegant silver can make you look. 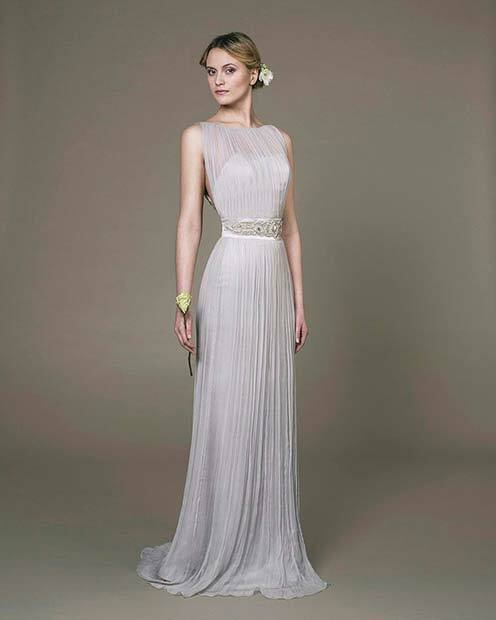 This gown is long and sleek with a beautiful belt. It looks effortlessly stunning and a dress like this will suit any wedding theme. The gown looks lightweight too, so it would be perfect for the warmer weather. Next, we have another unique idea. This is a short silver dress with 1950’s design. The skirt is shorter than the classic wedding dress but it still look chic and classy. It is the perfect dress for those who love 50’s fashion and who want to bring that theme into their bridal gown. Dresses like this one are feminine, beautiful and stylish.